Weather permitting, and based on availability, athletic fields at various locations can be rented for your group. 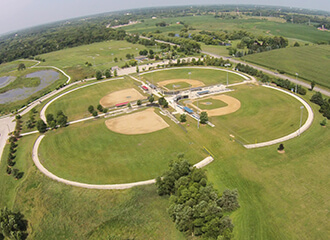 Please note: field rental reservations must be completed in person at the Crystal Lake Park District Administrative Office, 1 E. Crystal Lake Avenue, Crystal Lake. Please visit the Crystal Lake Soccer Federation website for information regarding the Soccer Complex. Players wear their normal spikes on the Sprinturf, and no special equipment is required. Infielders will get truer hops, and Sprinturf's softness will slow balls down slightly, unlike the artificial turf of years past. To help infielders' depth perception, the areas running from the base paths to the edge of the outfield grass will be tan. The rest of the infield is green to give the field a look like a high school infield.